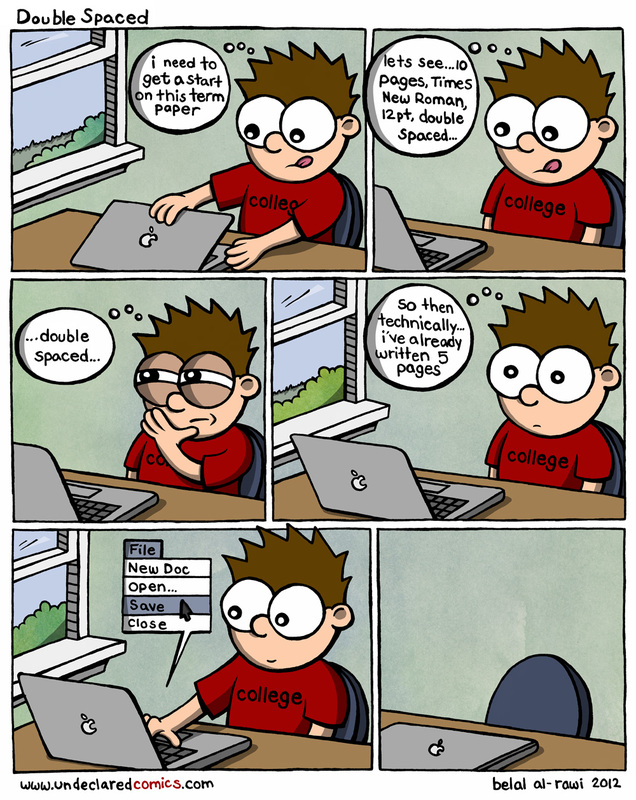 Think about it – a double spaced paper is half way done before you even start it. My logic is undeniable. Share your finals and term paper tips below. This is AWESOME! and so what I did when I was in School! Moose is a great name. I am incapable of making mistakes! I can not be wrong! Bwa-ha-ha-haaaaa (throw head back, evil laugh). HAHA! I do that too – instant satisfaction. I hate people that write their paper before the night thats its due. Show offs. I worked hard to to reach this level of procrastination. The typos and sleep deprivation are a price I’m willing to pay. Double spaced papers: 1/4 is the material you need to include, 1/4 is the fluff to fill up the rest of the space and the other 1/2 is the space between each line… Or that’s how I think about it anyway. And then, since I’m a graphic design major and I’m supposed to have it “graphically designed” i don’t necessarily have to adhere to the 1″ margins…. But my professor picks that up in the 11 pt font size… And I can tell I need sleep by how long this comment is… My apologies. If this was facebook I would have liked that comment. I’ve changed the size of periods before. Works like a charm. We divide the hole paper in two equal parts. If you have already done half paper and you haven’t written anything, the missing part, which has to be as big as the first one, is also anythin, so TECHNICALLY you’ve already finished. I totally did this pretty much all last semester. Why did you keep it a secret. WHY DIDNT YOU SHARE THIS KNOWLEDGE WITH THE WORLD?? I never thought about it that way before; that’s brilliant! Too bad I can’t start the paper the night before it is due and still get an A. Lower your expectations and you’ll be sure to over achieve. I dare you to write a paper like that and turn it in. Double spacing it would have made all the difference. I like subtly pushing the margins in if they weren’t specified. However, the BEST trick, and maybe the least known, is to go into formatting options and find the “character spacing” control. It’s the amount of white between each individual letter. You can up that and it’ll make a huge difference without being hugely noticeable. I only ever did that in high school. In college I had trouble writing under the maximum since I only took courses I enjoyed. Damn, I’ve never heard about that one before. I took 2 writing intensive classes that I liked – english (which turned out to be more like a pop culture class) and religious studies – I always went over by a few hundred. But they were short papers – 10 pages max. Wow these are all awesome ideas. College students are so creative when it comes to cheating on papers. I’m using some of these. want to know something sad? I went through 2 years of high school thinking double spaced was hitting the space bar twice….none of my teachers bothered to correct me. Haunter, this is in my Top 5 of saddest things I’ve ever read on the internet. Wow, Haunter, that is very sad indeed. That sure is a handy point to know.